“The Khilji dynasty was named after a village in Afghanistan. Jalal-ud-din Khilji overthrew Balban’s successors and founded the Khilji Dynasty, which ruled large parts of South Asia between 1290 and 1320. His own nephew and son-in-law Alauddin Khilji, killed Jalal-ud-din and took over as the new ruler. That was the second dynasty to rule the Delhi Sultanate of India. Some historians believe that they were Afghans, but Bharani and Wolse Haig explain in their accounts that the rulers from this dynasty, who came to India, though they had temporarily settled in Afghanistan, were originally Turkic”. The Khiljis were a Central Asian Turkic dynasty but having been long domiciled in Afghanistan, and adopted some Afghan habits and customs. They were treated as Afghans in Delhi Court”. The three sultans of the Khilji dynasty were noted by historians for their faithlessness and ferocity. To some extent, the Khilji usurpation was a move toward the recognition of a shifting balance of power attributable to the developments outside the territory of the Delhi Sultanate (in Central Asia and Iran) and to the changes which followed the establishment of Turkic rule in northern India. The court languages of the Khiljis were Persian, followed by Arabic, their native Turkoman language and some northern-Indian dialects. Although it was not their native language, the Khilji sultans encouraged the use of Persian. This co-existence of different languages gave birth to an early form of Urdu. According to Ibn Batuta, the Khiljis encouraged conversion to Islam by making it customary to have the convert presented to the sultan (who would place a robe on him and reward him with gold bracelets). During Ikhtiyar Uddin Bakhtiyar Khilji’s control of Bengal, Muslim missionaries in India achieved their greatest success in the number of converts to Islam. The founder of the Khilji Dynasty in South Asia, Malik Firuz, was originally the Ariz-i-Mumalik appointed by Kaiqubad during the days of decline of the Slave Dynasty. He took advantage of the political vacuum that was created due to the incompetence of the successors of Balban. To occupy the throne, he only had to remove the infant Sultan Kaimurs. On June 13 1290, Malik Firuz ascended the throne of Delhi as Jalal-ud-din Firuz Shah. 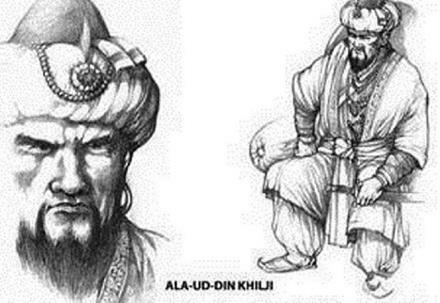 Khiljis were basically Central Asians but had lived in Afghanistan for so long that they had become different from the Turks in terms of customs and manners. Thus the coming of Khiljis to power was more than a dynastic change. As majority of the Muslim population of Delhi was Turk, the arrival of a Khilji ruler was not much welcomed. Yet Jalal-ud-din managed to win the hearts of the people through his mildness and generosity. Alauddin Khilji was one of India’s greatest kings and one of the world’s greatest military geniuses. He was born in Delhi in 1266 AD (and hence an Indian; not a foreign invader) and ruled as Sultan of Delhi from 1296 AD – 1316 AD. Khilji greatly expanded the empire that he inherited from his uncle, Sultan Jalaluddin Khilji, after killing him. Khilji is often seen as a villain. He retained most of the officers holding key positions in the Slave Dynasty. From 1296 AD to 1316 AD Alauddin Khilji dominated the Delhi sultanate with many courageous achievements. Soon after becoming the Sultan of Delhi Alauddin Khilji in 1297 AD went out to win over the various parts of Gujarat state Ala- ud-din also was able to implement startling economic reforms, although their effects were probably restricted to Delhi and the 100 mile radius around it. Nevertheless this was truly creditable for he achieved what modern governments in India have not completely achieved. Ala-ud-din re-organized the market so that there were fixed prices which were affordable, he developed warehousing facilities to ensure ready stock of goods; the government entered the business of transportation and provided facilities for the swift movement of goods. Alauddin’s reign is marked by innovative administrative and revenue reforms, market control regulations and a whirlwind period of conquests. It is considered the golden period of the Khilji rule. However, before the death of Alauddin, his house was divided into two camps. This resulted in the ultimate collapse of the Khalji dynasty. He died on January 1316 due to an acute health condition. The impact of Alauddin Khilj-13th century Sultan of Delhi. A critical dialogue on the legacy the 13th century Sultan left behind. It is time for a reckoning not only in how we see Khilji, but historical figures in general. Many historians have accurately pointed out that the real Khilji was highly influenced by Persian culture, that he used cruelty as a strategy and that he kept the Mongols out of India. A comprehensive assessment of Khilji’s policies and achievements. The most long-reaching effects of Khilji’s career were not merely military or territorial, though those were important. His policies also played an important and decisive role in India’s economic and political history. The shockingly rapid progress of Turkic and then Mongol hordes through the world from roughly the 10th century begs the question of why they were so successful in the first place. Their meritocratic, well-drilled and highly mobile cavalry armies crushed larger forces from China to Hungary and India. However, their true talent lay in psychological warfare. Jack Weatherford in Genghis Khan and the Making of the Modern World (2014) points out that the Mongols always offered cities as the option of surrender before ordering their complete destruction. Often, the brutal levelling of one city and the massacre of its ruling elite would lead to the rapid surrender of its neighbors to Mongol rule, thus saving on manpower. In the case of both the Turks and the Mongols, it took barely a generation to go from “barbaric” conquerors to rulers. This is a marked departure from earlier tribal confederacies such as the Huns and Vandals, but closer to the Kushans and Parthians. They would adopt local cultural practices, spread technology, enable trade and not interfere too much in the religious practices of their new subjects. The Turks differed in the last because they had already converted to Islam, but rulers like Alauddin Khilji were nevertheless more pragmatic than we generally think (Khilji, as attested to by Ziauddin Barani—a 13-14th century chronicler in the Delhi Sultanate—was one of the rare sultans who dared skip the Friday prayer). In one of history’s strange twists, by the 13th century, the once-nomadic Turks had to face the recently nomadic Mongols. It is in this context that we should see Alauddin Khilji. He is a Machiavellian (dare we say Kautilyan?) figure. In fact, Khilji’s ruthless adherence to the principle that the state must benefit at all costs, while being agnostic to religion, is strikingly similar to the views of the Arthashastra. As a young man, he led a lightning raid into the wealthy fort of Devagiri, supposedly capturing the raja while he was at dinner and holding him hostage until a ransom was paid and a marital alliance concluded. The funds thus accumulated were used to assassinate his uncle and place himself on the throne. As sultan, Khilji needed to defend his frontiers from Mongol incursions while simultaneously fending off assertive vassals and independent Indian states. The Indian powers were terrorized into submission through a ruthless application of psychological warfare, as Khilji’s actions against the Rajputs proved. This is because during his rule, the Mongols of the Chagatai Khanate invaded India. Khilji, by his military brilliance, managed to defeat the Mongols not once, but five times: in 1298 AD (led by Ulugh Khan, and inflicting 20,000 casualties on the Mongols), 1299 AD in Sindh (led by Zafar Khan), 1299 AD in Delhi (leading the army himself against the Mongols), 1305 AD (led by Malik Nayak, and inflicting 8000 casualties on the Mongols), and 1306 AD (led by Malik Kafur); and a “draw” in the sixth Mongol invasion of 1303 AD (again personally leading the army), where the Mongols were unable to defeat Khilji, but were able to sack Delhi. But that would betray a colossal ignorance of Mongol warfare. Had the Mongols conquered India, India would have been set back at least two or three hundred years in its development. All knowledge and culture that had been accumulated in India over millenia would have been destroyed. Every library, every school, every temple, every home would have been burnt to the ground. When Hulagu Khan of the Mongol Ilkhanate sacked Baghdad in 1258, he left the city largely depopulated. He destroyed all the great libraries of the Abbasid empire (it is said that the rivers turned black with ink because of the huge number of books the Mongols took from the libraries and threw in them), and blood was flowing in the Euphrates and Tigris for weeks after his assault. He single-handedly ended what is known as the Islamic Golden Age. A similar thing happened to Russia after the Mongols invaded it; it is considered that the Mongol invasion of Russia set it back by 200 years in its development. So the Mongols were not like any other invader. If Khilji had lost to the Mongols, it would not have been as benign as when Ibrahim Lodi lost to Babur. In that case, one Muslim ruler was replaced by another, but India itself did not suffer greatly. If the Mongols had won against Khilji, they would have wiped Indian civilization off the map of the world. For better or worse, they have brought us to where we are, and remind us what we can do better. But to keep this up, he would need a large standing army, not a traditional feudal levy to be raised only when in danger. In an almost Ciceronian bent of mind, he seems to have recognized that the sinews of war were infinite money, in addition to Mongol-style psychological attacks. Using the territory of his compulsory ally, Devagiri, he dispatched a series of raiding expeditions south under his general Malik Kafur, while terrorizing the Mongols, building their severed heads into the foundations of Siri Fort in Delhi . Kafur, too, used shock-and-awe tactics. The infantry and elephant-focused armies of the south were out maneuvered, supply lines severed, and smashed separately before they could converge. The rougher terrain of the Deccan gave them some edge against cavalry (which does best on flat terrain, but the Turkic officer core and army organization, perfected in mobile battlefields of Central Asia. As a result, kingdoms such as the Hoysalas and the Kakatiyas tried to buy time with ransoms but were ultimately defeated. Khilji’s campaigns completely upset the Indian status quo. The dynasties which he had uprooted adhered to an older form of kingship, a sort of sedmented sovereignty which compelled the ruler to recognize the hereditary rights of interest groups such as village councils, landed nobility, and merchant guilds. But recent scholarship, especially work done by Burton Stein, points to a broader trend of migration of hardy warrior-peasants (especially from Andhra) into the rocky Deccan that was already in place, creating new urban centers which threatened the older landed order . By shattering this older order, he cleared the way for the creation of new states, the emergence of new interest groups, and therefore new social and political equilibria. The turmoil which he caused opened up military and administrative careers to castes that would otherwise have been excluded. It might not have been intended, but it is no less real or significant. Khilji, however, was not interested in setting up shop in the turbulent and distant south. His primary concern would remain the Mongol incursions and maintaining his grip on his North Indian territory. Booty from raids was generously spread among his supporters, increasing the money supply and causing skyrocketing inflation. This could be one of the reasons for the implementation of his infamous system of price controls. Another could be the expense of maintaining a large standing army, which, like in most empires, necessitated a vicious cycle of more conquest to fuel an even larger army. The Indian states of the 13th century onward were more integrated into the global economy and the latest technological and military advances. The Bahmani Sultanate and the Vijayanagara Empire learnt well from the campaigns of Alauddin. Trade was a major priority for Vijayanagara, and control of the ports of Tamilakam and the Konkan Coast was deemed important enough to call halts to civil wars. Sovereigns took care to import the best cavalry from the Arabs and gunpowder weapons from the Portuguese, and recruit Turkic officers. Armies (in the initial period) were relatively meritocratic and many, including the family of the famous ruler Krishna Deva Raya, rose to prominence through military service. Other groups of cultivators-turned-rulers, remain prominent to this day, and the migratory movements which could happen due to the anarchy of the 13th century left a significant imprint on the demographic profile of India. A wonder of the world? The sultan’s price control department wasn’t just an organization full of harmless bureaucrats with misplaced incentives (our modern equivalent perhaps is). The Diwan-e-Riyasat started by keeping essential commodity prices low for soldiers (so Khilji could pay them less) and soon expanded to every item in Delhi’s markets, from camels to cloth. But these price controls inevitably led to black market trading as a new equilibrium was reached between buyers and sellers. In addition, famines inevitably led to hoarding and shortages. To deal with this, an intricate spy network ensured that any violations to the system were reported and dealt with. In times of scarcity, the entire city of Delhi was put on rations and fed only from government granaries, which acquired grain at fixed prices. Barani informs us that any merchant who was found cheating the standard rates was penalized by cutting off an equal weight of flesh from his limbs. Still standing in the heart of South Delhi, functioning as roundabout for traffic, is Khilji’s Chor Minar. This was used to display the heads of thieves or dacoits who tried to defraud the system. These are further examples of the sultan’s willingness to use calculated, deterring cruelty to further what he saw as the interests of the state, and again an eerie echo of the Arthashastra. Both adhere to a cold-blooded form of political realism, explored at length by scholars such as R.P. Kangle, J. Patrick Olivelle and Thomas Trautmann, which is often visible in the subcontinent. Within a few years of Alauddin’s accession, Delhi became unrecognizable. Practically a surveillance state where the Big Sultan knew all , its markets boasted possibly the most elaborate system of price controls ever conceived, at relatively cheap prices compared to global standards. In times of famine, amazingly, every household in the city had something to eat, enabled by a sophisticated system of go downs and warehouses. Contemporary travelers’ accounts describe the fixed prices, come hell or high water, as a wonder of the world. The system allowed Alauddin to maintain, arguably, the largest, best equipped force ever fielded by the Delhi Sultanate, with observable results. But the policy had other ramifications. The peasantry and landed nobility had little incentive to increase production, struggling under heavy tax burdens. The sultan refused to lower the taxes they paid and his land surveys—the first in the history of the Sultanate—allowed him to keep a keen eye on defaulters, and tax cultivators directly. Merchants, too, could not pursue profits beyond what the sultan allowed (a departure from Kautilya, who has more farsighted views on fair prices and profiteering). Irfan Habib points out in Cambridge Economic History of India Vol-1 that real wages for labourers remained low, and Khilji often had to subsidizes merchants, though Abraham Eraly argues that the improved functioning of state institutions could have allowed for some degree of prosperity. While prices were kept constant in Delhi and nearby markets, they kept increasing as per the free market in other parts of the world, creating excellent arbitrage opportunities for traders who were willing to take the risk of getting their heads chopped off. Gujarati textile merchants made full use of this opportunity, buying cheap cloth from Delhi and selling it at places like Mecca for a delicious 700% profit. Coastal trade grew leaps and bounds, with wealth essentially being transferred from the once-dominant urban center of Delhi to new ones on the coast. These new centers came at a point when the fledgling empires of the Deccan were rising, and would have played a vital role in integrating India into global maritime trade, which was rapidly expanding. This is an important effect, which most Delhi-centric views of Khilji’s rule neglect. Ultimately, it is difficult to say whether Khilji was a savior or a villain. But that is the point of looking critically at our past—nobody can fit into a single category. Value judgements on those whose values were so different from ours do not help us move forward. Indeed, the idea of a normative approach to something as inexorable as the march of time and history is absurd. Instead, we need to objectively understand what historical figures did and how it impacted our ancestors—not just in one part of the country, but throughout our subcontinent. Was Alauddin Khilji actually after Rani Padmini? The Rajput community was fighting against the film and calling for a ban since they wanted to protect the dignity of Rani Padmini in whatsoever manners. Alauddin Khilji was one of greatest emperors in Indian history. He was the one who protected India from Mongolese. Had he not been there, there might not be the India we live in today. Author RV Smith in his book ‘India that no one knows’ and ‘Delhi: Unknown Tales of a city’ has said that Alauddin Khilji had attacked the city of Chittor to expand his region, and not to win Rani Padmini. After defeating The King of Chittor Maharaja Ratan Singh, he came to know about the beauty of Rani Padmini and he just wanted to have a look at her. Smith, in his book, said that after 250 years of the death of Khilji poet Malik Muhammad Jayasi made the most notable work is the epic poem Padmavat. To make it more entertaining, he added some fiction. He even crossed out the fact that Rani Padmini committed Jauhar in order to save herself from the hands of Alauddin Khilji. She jumped into fire to commit Sati which was a common practice at that time since her Husband Ratan Singh lost the war. It is said that Khilji was the first emperor of Delhi who stopped Black Hoarding.